been shortlisted for our 2018 Poetry Competitions. What a meticulously organised competition, and fascinating to read all the entries, some very local and some from far afield. The sea was a frequent presence. I love reading poems unaccompanied by their authors, just encountering the art. Trawling through them was like a treasure hunt, many adventures with words had along the way, through various and enthralling worlds. Thank you to all who entered and entrusted your poems into my hands. I am impressed and thrilled with the ten that were shortlisted. First, second and third prizes in each competition will be announced by judges Pascale Petit and Liz Diamond, at Teignmouth Poetry Festival 2018, when all the above poets are invited to read their poems at the awards ceremony. 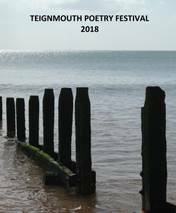 Teignmouth Poetry Festival 2018 Competition Results - Saturday March 17 at 8.30, Pavilions Teignmouth. Full details including map are on the Festival 2018 page.